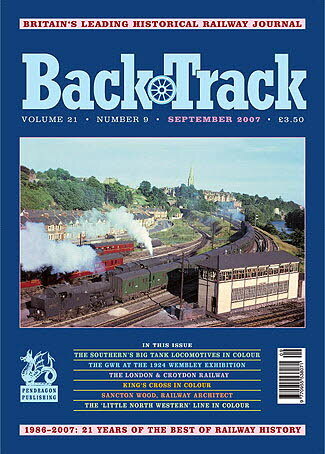 Railway Magazine | BackTrack Sept 2007 journal from Pendragon Publishing. The Southern's Big Tanks - The SR's W and Z Class tanks in colour. The GWR at the 1924 Wembley Exhibition - Peter Rance reviews the Great Western's experiences at the British Empire Exhibition..
Posted at Cheltenham - two night colour shots of the Travelling Post Office at Cheltenham in 2000. The London & Croydon Railway and the Croydon Canal - Jeremy Clarke tells the story of two early Surrey transport systems and how they came together. GWR Goods Instruction Notices - J. Crosse extracts some tales of everyday life in the 1920s. The Bombing of Britain's Railways 1939-45: A War Diary - Part Two - Â John Helm's series covers the period from September 1940 and the London Blitz to April/May 1941. By rail and sea to Chepstow - Colin G. Maggs traces an adventurous journey made in 1872. Out of King's Cross - five pages of colour shots of steam at KX and on the climb out of London. Sancton Wood, Railway Architect: Part 1: Gordon Biddle considers the career of a notable figure in railway station design. Wells and Weston: A Corporate Experience - Alan Bennett shows how the Great Western promoted Weston-super-Mare, Wells, Glastonbury, Cheddar Gorge and Wookey Hole. Thomas Worsdell, August von Borries and Two-Cylinder Compounds - the second part of Michael Rutherford's survey. On the 'Little North Western Line' - colour feature on the scenic Settle Junction to Lancaster and Morecambe route. An Odd Bunch - Philip Atkins looks at 20 locomotives built in the early 1920s for four different railways which bucked the trend by not been equipped with superheating. Do this, Do that! - another colour selection of quirky railway notices.